Pizza. I could eat it e’eryday. But, then I would probably turn into a big pizza, which is not what I want out of life. Thankfully, there’s a solution. I can reserve My Favorite Vegan Pizza for weekends, The Best Ever Gluten-Free Pizza for Tuesdays, and this lovely mushroom pizza pie for Thursdays. I really did want to make portobello pizzas because I have a thing for mushrooms and wanted to make pizza night a bit more wholesome and plant-based. Even though pizza with traditional crust is fine, especially when laden with lycopene-rich tomato sauce and loads of veggies and nutritional yeast, it’s still like eating bread. This was my (ultimate pizza) cheat. And guess what? While it’s not a 1:1 pizza swap, it’s a lovely change of pace. & Not like you’re eating a loaf of bread. Win-win! If you make this pie, you should probably take a picture and tag it #minimalistbaker on Instagram. If you do, it would make me so happy. If you don’t, it would make me so sad. 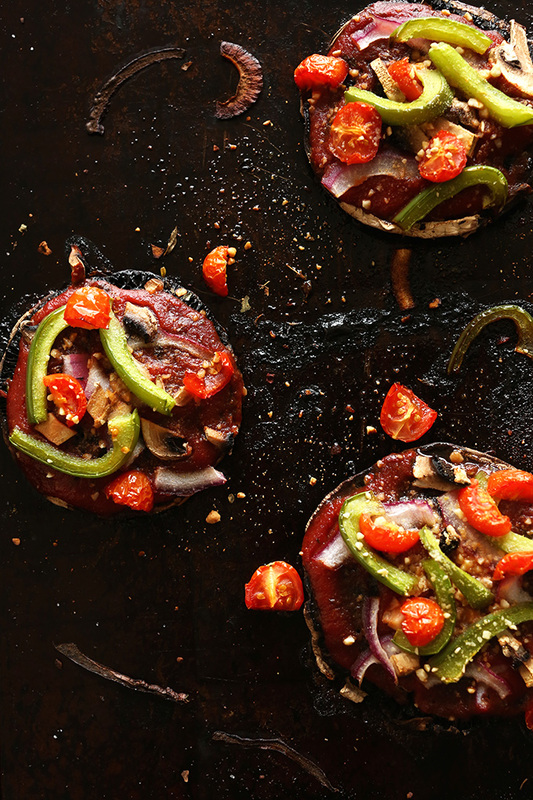 8-ingredient vegan and gluten-free pizzas that are entirely plant-based. Roasted portobello crust, savory tomato sauce, fresh vegetables, and vegan parmesan! 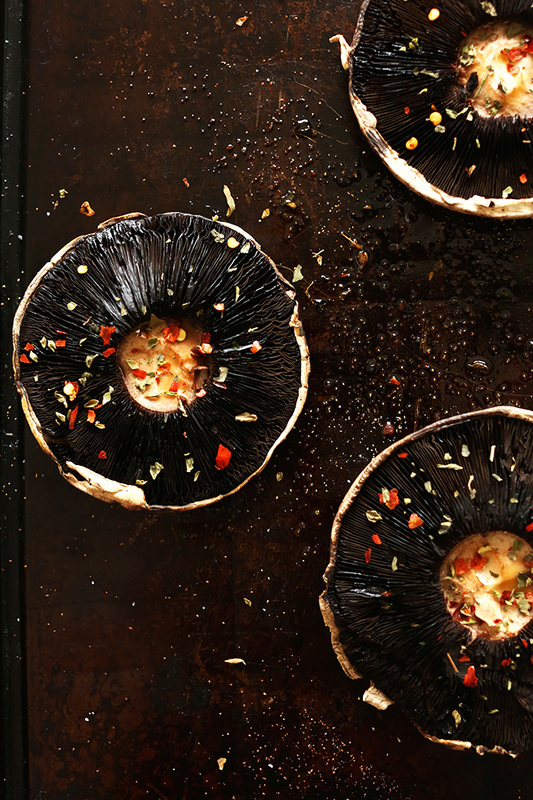 Place cleaned mushrooms on a baking sheet and lightly drizzle both sides with a little olive oil. Sprinkle with garlic powder, basil, and oregano. Then bake for 5 minutes. In the meantime, prep veggies and prepare pizza sauce if you haven’t done so already. Once par-baked, pull mushrooms out of the oven and top with desired amount of pizza sauce, veggies, and a sprinkle of vegan parmesan. Bake for 15-20 minutes, or until the veggies are mostly cooked. Serve with fresh basil, red pepper flake and extra vegan parmesan. *Nutrition information is a rough estimate calculated with vegan parmesan cheese. These were very delicious ? great recipe! These were delicious! The portobello prep was easy (!) and we used Trader Joe’s Tomato Basil Marinara, a family favorite. Our veggies included fresh tomatoes, orange bell pepper, and sweet onion (i.e. what I had in the veggie drawer). Next time we are going to skip the oil (BTW, I can’t drizzle without the oil glubbing out of the bottle and soaking everything so I use a basting brush) and try basting on a bit of (vegan) pesto. Or we may use the pesto instead of the tomato sauce. Other veggies we might try include canned artichoke hearts, peas, or sun-dried tomatoes. This recipe has so many possibilities and yet it’s so easy and so delicious! Thank you! DELICIOUS!!!! I bought a 4 pk of the Portabella Caps and ended up cooking ALL OF THEM! …i actually used my GF grill! This was incredibly delicious! We can’t wait to make it again. The parmesan recipe will be a new staple for us, too. Thanks for another great recipe, you are very innovative!! learn far more from you. That is really a great web site. Though…(no meat by products). Please share how that’s part of a Vegan diet. These were great! We sauteed up some asparagus, red onion, yellow pepper and zucchini before putting them on the pizzas. We decided against mushroom-on-mushroom action with topping. We used leftover 3-tomato sauce from MarthaS. Loved the parm cheese, even without nut’l yeast because of allergies. Thanks! Wonderful! Thanks for sharing, Nina! The mushrooms were so watery! I will try again as we enjoyed the flavors. Maybe even try grilling them. 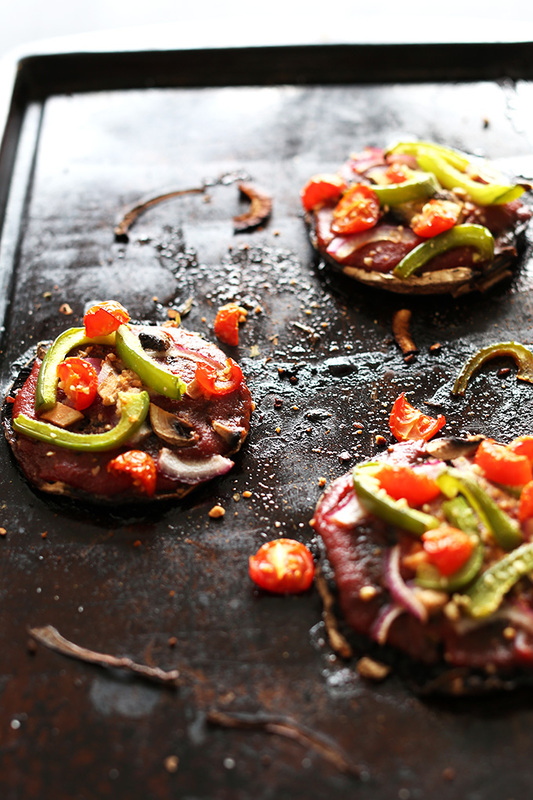 I love these portobello pizzas! I just made them for the second time tonight. My 3 year old son ate his whole mushroom! Thank you Dana. Your recipes are second to none! Delicious. I substituted grapeseed for olive oil, which can catch fire at high temperatures; used sliced parsnips (which were on hand) as the vegetable; and added some grated almond cheese for the last few minutes of baking. Mmm. One per person is not quite enough. I just made these and they are incredible!! We only had raw spinach, yellow peppers, yellow onion and tomatoes and they were ridiculously good! Thank you! Yay! Glad you enjoyed them, Heather! I’m new! I’m cooking this now, I am so excited but I am a little confused. Do I sauté the veggies first with the pizza sauce or just go for it? Lol ahh! These were absolutely phenomenal! I topped mine with the same vegetables as you did, with the addition of kale and red peppers. I think I’m going to make these as appetizers for my son’s 2nd birthday with baby portobellos. They were that good! 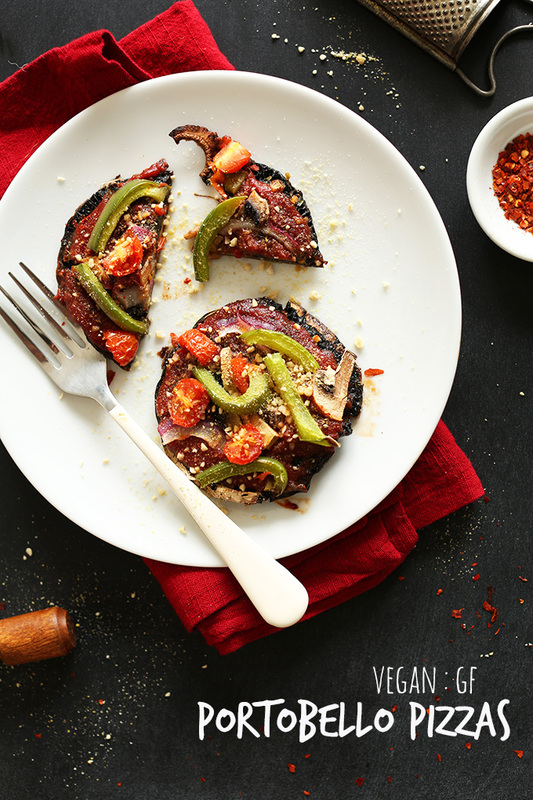 Portobello pizzas are my favorite weeknight dinner! They are so easy to throw in the toaster oven! These mushroom pizzas (mizzas?) look absolutely delicious! I am so looking forward to trying these, what a great way to replace the less healthy (but yummy) dough I usually use. Ooh!!! Mommy, mommy, mommy, mommy!!!! Please, pretty please with a cherry on top, i NEED some portabellas!!! These are so fab and fresh! And especially perfect for summer. You’re so creative with your recipes. Have a fantastic weekend! I love everything about this…looks delicious!!! this is the best idea to use mushrooms as a pizza base.. the vegetarians in my household will definitely appreciate me making these. thanks for the idea! These babies will be on the grill Saturday night. Thanks Dana for keeping my Vegan diet SpiCy! Love this! 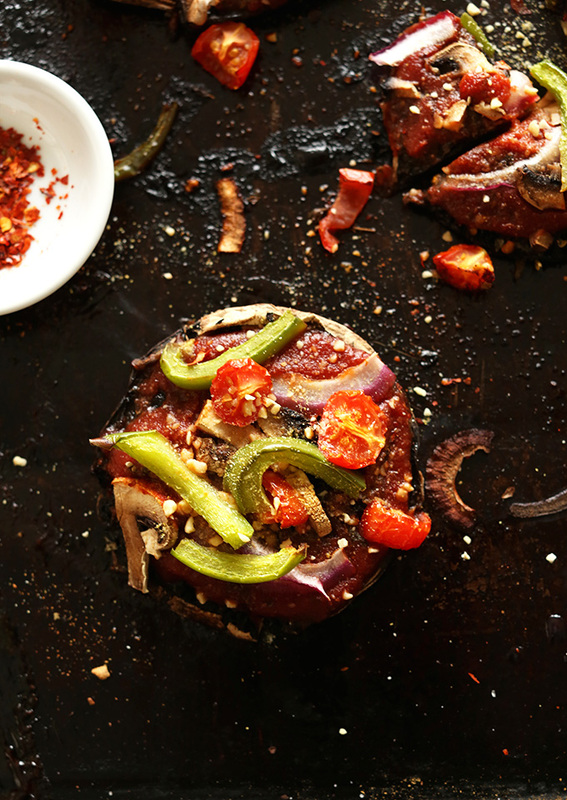 Portabellas on the grill are one of the most delicious things – ever! Right? So perfect on the grill. Wish we had one but we don’t have a patio at the moment! Oh we don’t have a patio either… we pull our grill out of the garage and onto the sidewalk – real fancy let me tell you! Just brilliant!.. 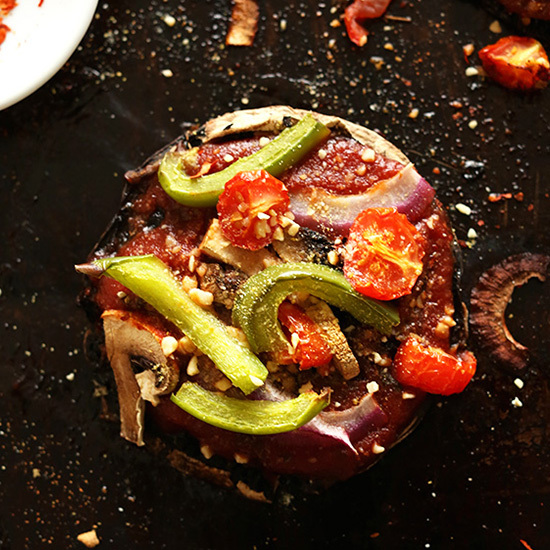 The taste of pizza without the crust… Just bought 4 portobello mushrooms and I know what I’m making for dinner! Nice! Let me know how it goes, Rosanna! Yum! I would say this is a delicious compromise from pizza. This looks delicious! I can’t get enough of Portobellos so pizzas seem like a great way to use them more. :-) I imagine these would be great with some cashew or eggplant cheese sauce, too. Ooh, yeah! Great idea. Let me know if you give it a try! These are the most swingin’ pizzas I’ve ever seen! I have a not-so-secret love affair with mushrooms! I never thought it was possible to have a pizza that was healthy for you and also tasted good. This is a dream come true. Mushroom and pizza combined?! Yes please!! !